We all likely know at least one person who’s afraid of the doctor — that person may very well be ourselves. Going to the doctor is not exactly what one would call “fun,” but for some people, it’s anxiety-inducing and downright terrifying. A fear of the doctor (otherwise known as iatrophobia) is tough to deal with for several reasons. For one, it’s a source of fear, but what’s more, it can prevent people from getting the help that they need. If you avoid the doctor (such as our sinus doctor) out of fear, any existing problems you might have can end up going undiagnosed and worsening. In today’s blog, our sinus doctors are going to go over all the components of being afraid of the doctor, and how you can best deal with them all. As scary as it can be, this fear is absolutely one that can be overcome. 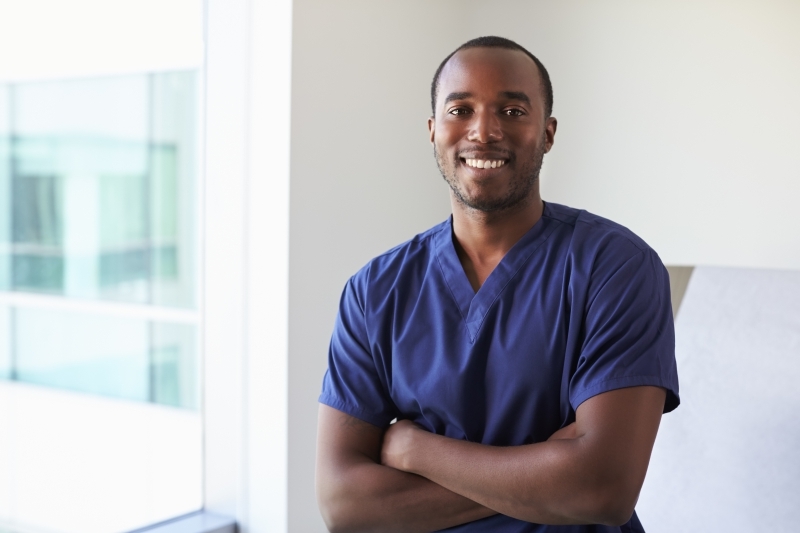 Learn more, and face your fears by booking an appointment with Detroit Sinus Center today. 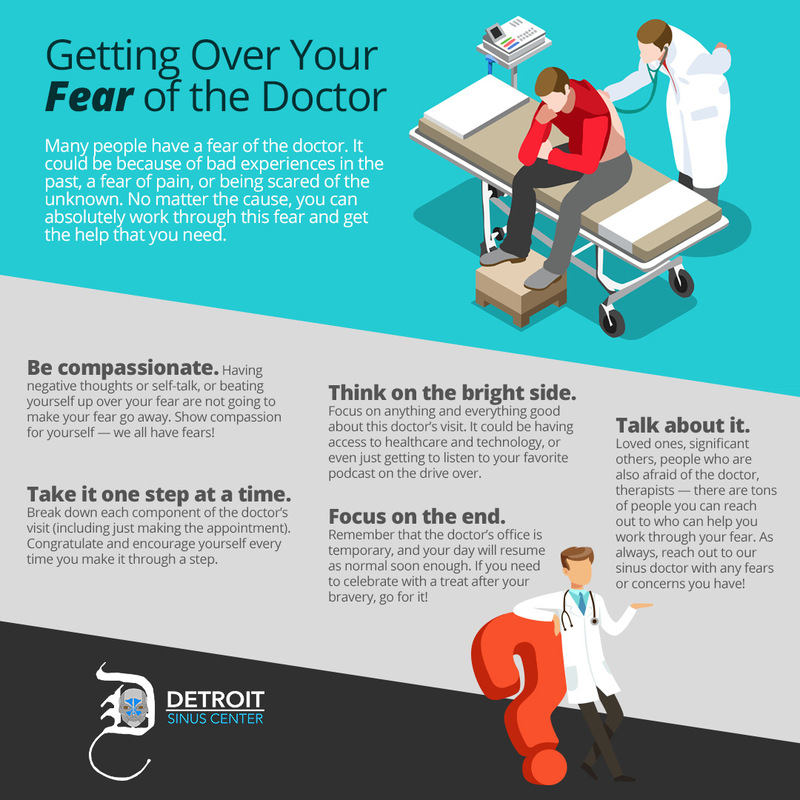 We’ll dive into some of the specific fears that people face with going to the doctor, but first, here are some general rules that can be applied to any doctor’s appointment. We all have fears, and that’s OK! Giving yourself a hard time or saying negative self-talk is not going to make your fears lessen (it could very well do the opposite). Think about what it is you’re afraid of (more on that below! ), address the fear, and be gentle with yourself. Acknowledge that you can’t let your fear of the doctor stop you from getting healthy, but don’t beat yourself up over being afraid. It’s a normal and natural human emotion. Your very first step? Making the doctor’s appointment. You don’t need time to lead up into this, just call (when they’re open) and make your appointment. That’s all you have to do for right now. When it’s time to go to the doctor, your next step is leaving in a timely manner. Then it’s walking inside and being seen. Think about each step as levels in a video game, and congratulate yourself mentally for completing each step. Doctor’s appointments aren’t everyday occurrences (if we’re lucky). There are tiny moments throughout the process of going to the doctor that can be joyful, and distract you from your fear. Maybe you’ll finally get a chance to listen to your favorite album in the car (and not the kids’), or you’ll have some extra time to read your favorite book. Even scrolling through your phone is something small that can distract you and make you feel good. In nearly every situation, something good can be created or found. How are you going to celebrate overcoming your fear and being brave? Are you going to treat yourself to your favorite spot for lunch or spend some time reading? Are you going to talk to your loved ones and get some praise and encouragement from them? When you think about the bright and positive things ahead, after your doctor’s visit, it can give you something to focus on instead of focusing on your fear. Many people have a mild to moderate fear of the doctor. We encourage you to talk to your loved ones about it, and as always, to let us know as well! Our sinus doctors would love to know if you’re feeling anxious or scared, because it can help us help you even better. We will always do what we can to make sure you’re feeling comfortable. And remember, if there’s something you don’t feel like doing, you can always say no. If you have a more severe or even debilitating fear of the doctor, consider reaching out to a therapist. They can help you get to the root of your fear, and better support you in working through it. Additionally, you can always check our testimonials to see what previous patients have said about getting balloon sinus dilation, sinusitis treatment, and their overall experience at our sinus clinic. Is it better for you to avoid going and continue feeling sick or not know what’s going on, or for you to deal with your fear for a few hours and get answers? Those hours can be tumultuous and full of fear, but they will be a short-term struggle for long-term gain. Plus, if you don’t get the help you need now, the result might be needing even more doctor’s appointments in the future. The sinus doctors at Detroit Sinus Center want you to feel comfortable and worry-free when visiting our clinic. You already have enough stress with feeling sick, let us help alleviate some of the stress by providing you with information and answers. Contact the area’s top choice for sinus care and face your fears — book a visit with our sinus doctors today.